She was giving evidence before Kurunegala High Court Judge Menaka Wijesundara when former Minister Johnston Fernando’s case of misappropriating Rs. 5.2 million of Sathosa funds was taken up for hearing yesterday. When she was questioned by Senior Deputy Solicitor General Rakshana Abeysuriya on behalf of the Attorney General, she said the letter had been sent by the Board of Directors on the instructions of the Sathosa Manager and Secretary to the Sathosa Chairman. She said the materials were issued from the Yanthampalawa Branch based on four copy-receipt and the third copy of the receipt did not include the recipients’ names. She told that the copies of the tippexed letters were correct when they were showed to her by the Senior Deputy Solicitor General. An officer of the Government Analyst’s Department, Kalupage Apsara, gave evidence before the Court yesterday. She said the Government Analyst Department received the document on July 9, 2015. It was analysed using chemicals and observed that the letter had been tippexed except for the phrase, ‘on the request of the Minister’ . She told that two signatures were in the letter and one was of the Minister and the other was fake. She accepted that signatures might have put by one person. Former Lak Sathosa Chairman K. M. Fernando and former Minister’s Private Secretary Raj Mohideen Mohamod Sakeer were served with indictments for aiding and abetting the offence. The three suspects are charged under the Public Property Act. Fernando as the Minister in charge of the Cooperative Wholesale Establishment (CWE) had allegedly ordered that goods worth over Rs. 5.2 million be released from three CWE warehouses in Yanthampalawa, Wehera and Mallawapitiya in the Kurunegala District during the North Western Provincial Council Elections in September 2013. The hearing was postponed for Thursday. 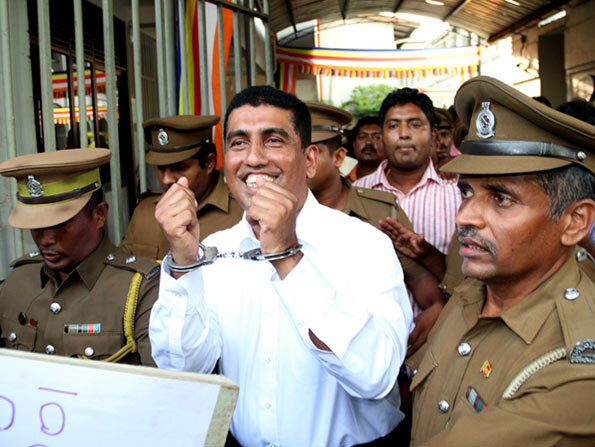 Deputy Solicitor General Rakshana Abeysuriya appeared for the Attorney General.President’s Counsel Kalinga Indatissa appeared for the suspects with the assistance of Attorneys Indika Giragama, Harin Saddasena, Rashmi Indatissa, Milantha Jayasinghe and Resan Widhanagamage. What sort of people are these proud to be hand cuff. What sort of example these criminals gives to the youngsters. Shame man shame.